To promote FIIB as a source for top talent for the industry by preparing our students to find internships, live projects and full time employment. Provide employers concentrated, targeted and focused access to management students. Prepare students to effectively market their value to prospective employers. Partner with alumni and faculty to augment existing resources and create better opportunities for students. Liaison with recruiters for developing employment and internship opportunities that aligns with students’ objectives and career plans. Build and develop new corporate partnerships and existing recruiter relationships. 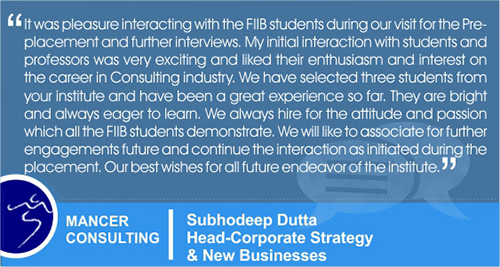 Facilitate interface with industry through Seminars, Guest Lectures, Conferences and Corporate Meets.